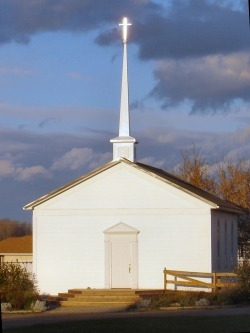 The Plains Road Bible Church was originally located on Plains Road in Aurelius Township. It was reconstructed on the Miller property making it the first building for our village. 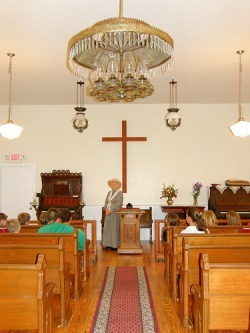 The church was moved to the seven acres at the back of the Miler property and is open and available for weddings, baptisms, and other church functions. The church was built over 150 years ago, along with its cemetery. There is little information about the use of the building prior to 1951, except that a Baptist group had previously used it and abandoned it. In 1951, the Reverend Sylvester D. Baker opened the church as the Plains Road Bible Church. He started his first ministry in this building and it lasted 39 years. The building was given back to the township in 1990 and boarded up. For the next twelve years it was used only by raccoons, ground hogs and a swarm of angry bees until the Historical Society took the building over in 2002. The beautiful stained glass windows were donated by the Robbins Church. They were restored and put in place by members of the church under the direction of Bud McGeachy. 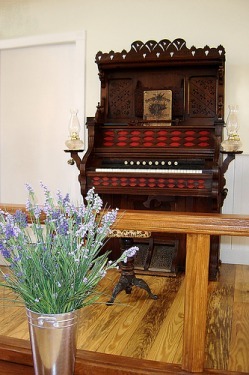 The antique organ was donated by Barbara Rogers and the piano was donated by the Robbins Church. The renovation took many volunteer hours, hard work, and a lot of donated money, but it was all worth it as we now look at how beautiful it is. Weddings: The church is available for weddings. Call (517)285-0010 for more information. The chandelier is original to the building, and and was found still in place above a false ceiling. Each kerosene lamp was lovingly cleaned and returned to its spot on the chandelier, with their mis-matched but original chimneys in place. The pews are also original to the building, along with the lectern and Bible. 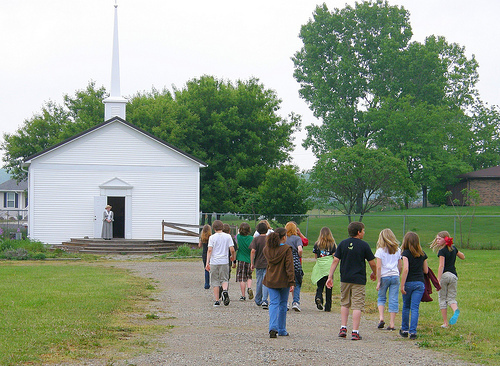 Students visit the Miller Farm and enjoy visiting all the historical buildings on the property. It helps them experience a bit more clearly what life was like in the past. This window was one of the five that were donated by the Robbins Methodist Church. They had been removed from their church, and were in storage, and were offered for installation in our church. They would have been from the same time period as the church is. 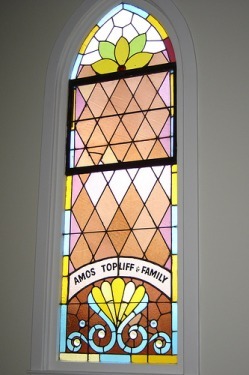 This particular window was installed by a direct relative of Amos Topliff.